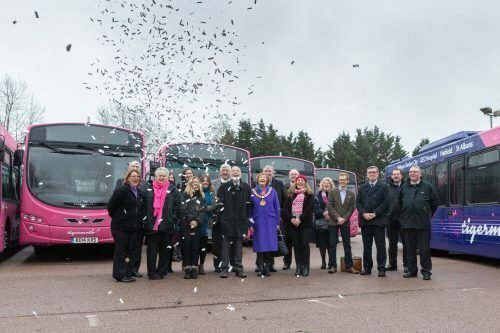 Uno Buses has commemorated the inspirational women of the Air Transport Auxiliary at the launch of its new bus brand, ‘Tigermoth’. The new brand is named after the de Haviland biplanes manufactured at Hatfield aerodrome, and each of the eight branded buses will commemorate one of the first eight women who joined the Air Transport Auxiliary in 1938. The ATA was a civilian organisation which ferried planes between factories and frontline RAF airfields during World War II. The first female members of the ATA flew the first delivery of Tiger Moth ‘open cockpit’ planes from Hatfield up to Scotland in the depths of winter in World War II. The eight Tigermoth buses will run on Uno’s 653 service between Hatfield, Welwyn Garden City and St Albans, inscribed with the name of one of the ATA female pilots on the front of the vehicle and inside the bus there will be a photo and further information about her life and the ATA. Jim Thorpe, Managing Director of Uno Buses, said: “We’re delighted to be able to honour these amazing women and help share their story as widely as we can.